Here at Abode, we feel so lucky to be based in Liverpool! With beautiful buildings and various cultural hotspots, it seems as if every area that we work in has a rich and vibrant history. The north Liverpool suburb of Crosby is a lovely little gem. Known for it’s fantastic state and private schools, it has the luxury of being close to the beach and countryside, whilst only being 20 mins away from Liverpool’s city centre! In recent years, many high-quality bars and restaurants have popped up in key locations such as Moor Lane (A.K.A. The Village), Coronation Road and College Road. There are also a variety of parks, shops and sports centres, meaning that there is something for the whole family. Take a look at our current Crosby listings here. With its close proximity to the city centre and array of stunning properties, Aigburth is an area of Liverpool that is highly-sought after. 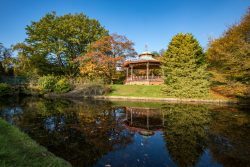 Nearby you’ll find Sefton Park, the famous Grade-I listed park that covers over 200 acres. This then leads onto the beautiful and serene Otterspool Promenade, another much-loved attraction that is great for people of all ages. Whilst the area is family-oriented, it is also perfect for young professionals and students, with a key highlight being Lark Lane. Commonly referred to as ‘The Lane’ by locals, it boasts a mixture of independent and quirky shops, bars and restaurants with Keith’s Wine Bar, Elif and Milo Lounge being established favourites. See all of our Aigburth listings here. Nestled in between Liverpool’s leafy suburbs, Woolton is an incredibly desirable area to live. If you’re a Beatles fan, then you’re in luck. 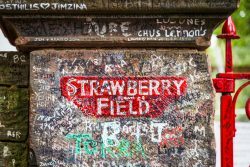 Famous for its association with the Fab Four, Woolton is home to Strawberry Field, the church hall where John Lennon and Paul McCartney first met, as well as John’s childhood home (Mendips) which is located on Menlove Avenue. Even without the Beatles, the suburb is known for its beautiful Georgian terraces, community spirit and wealth of bars and restaurants. Have a browse of our current Woolton listings here. We hope that this guide has given you a good insight into some of Liverpool’s best suburbs. If you’re looking to buy, then take a look at our buying guide and find out how we can make the process as easy as possible for you.